Discussion in 'General Freemasonry Discussion' started by Bro. Stewart P.M., Jan 29, 2009. The "Santa Anna" discussion has prompted me to contribute one of the Masonic History moments that I presented to my Lodge a few months ago. I hope you enjoy it. Freemasonry first began to take root in Texas on February 11, 1828 at San Felipe de Austin at a Called meeting by Stephen F. Austin for the purpose of petitioning the Grand Lodge of Mexico for a Charter to form a Lodge. The petition made its way into Mexico City, only to never be heard of again. The Mexican officials sensing that Texas might attempt to gain independence outlawed Freemasonry in October of the same year. Then in March of 1835 with the help of Anson Jones, five Masons met in Brazoria under the Masonic Oak and petitioned the Grand Lodge of Louisiana for a Charter. Henry Holland granted the dispensation, and Holland Lodge No. 36 was formed in December. It was only a few months later that Texas declared its independence from Mexico, and the historic war was underway. It wasnâ€™t long before the Holland Lodge fell under attack by the Mexican Army leaving all of its records and equipment destroyed. It wasnâ€™t until 1837 that Holland Lodge was reestablished in Houston. During 1837 the Grand Lodge of Louisiana issued two additional charters to Lodges located in Nacogdoches and San Augustine. In December of the same year delegates from all three Lodges met in Houston in attempt to form the Grand Lodge of the Republic of Texas. Among those who met that historic day were Stephen F. Austin, Anson Jones, and Thomas J. Rusk. By the end of the session Anson Jones was elected the first Grand Master in the Republic of Texas. It was not until April 16, 1838 that the delegates reconvened in Houston and the â€œGrand Lodge was opened in ample formâ€ and that â€œthe jurisdiction of the Grand Lodge of Louisiana was endedâ€. It is noted that during the time that Texas was a Republic only 1.5% percent of the general population were Masons. Incredibly 80% of the Republicâ€™s upper government was Brother Masons, including every president and vice president. Eleven of the twenty-five committee members responsible for drafting the constitution for the Republic were Masons. 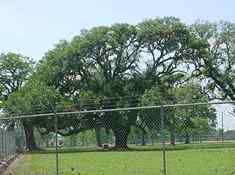 Grand Lodge of Texas History Committee â€“ Written by Loyd Addy, Jr.
Photo Courtesy Julie McConnell [/FONT] [FONT=Arial, Helvetica, sans-serif]The Masonic Oak stands in the Old Brazoria Cemetery (see Readers' Comments) - on the south side of Pleasant Street in Brazoria. This area had been designated as a cemetery in 1833. It was on property that had belonged to (General) John Austin who had died of cholera in 1833. Photo Courtesy Julie McConnell [/FONT] [FONT=Arial, Helvetica, sans-serif]This organizational meeting consisted of five or six Masons - including Dr. Anson Jones. After organizing, a petition was sent to the Louisiana Grand Lodge and the Texas Grand Lodge was granted soon after with Anson Jones as the first Grand Master. Anson Jones was a Massachusetts physician who had failed at business in New Orleans and had just spent two years in Venezuela. 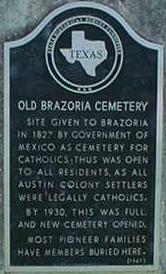 He was coaxed into coming to Texas by close friends in Brazoria. In a few years he had a thriving medical practice and he eventually became the Third (and last) President of the Republic of Texas. Although he retired to Barrington - his farm in Austin County - Jones had suffered from depression for years and eventually committed suicide at the Capitol Hotel* in Houston. The capital building also doubled as Holland Lodge at the time. It later turned into the capital hotel which is where Anson Jones commited suicide. The Rice Hotel now resides on this same plot of land; it is the last place President Kennedy laid his head to sleep. it is the last place President Kennedy laid his head to sleep.